For those watching the search results to see how well (or not) sites have done with Google’s latest core algo update, you will need to watch for quite a lot longer. Google has confirmed that the algo update is still rolling out. Danny Sullivan from Google has confirmed that the latest update is still rolling out. 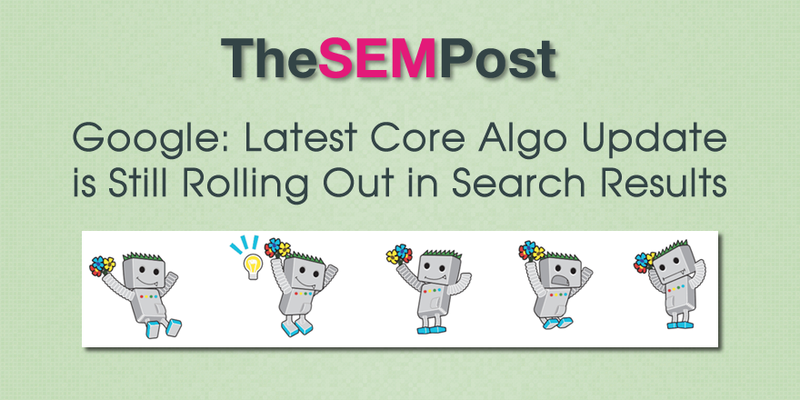 This isn’t unusual, Google’s algo updates usually take anywhere from a few days or even a week or two to fully roll out in the search results. Sullivan also confirmed that the algo update will not finish rolling out until the middle of next week, so we will see fluctuations in the search results from this core algo change until then. A few days. Say by middle of next week, should be fully rolled out. So if you are concerned about any losses or gains in rankings in the search results, you should avoid any knee jerk reactions to quickly make changes until the rollout is complete, unless you are just making quality improvements. It isn’t unusual to see sites fluctuate dramatically while an update is rolling out, and see the site end up back close to wear it started when an update has finished rolling out. But those fluctuations can also be permanent, even when the rollout isn’t yet complete. For more information on this update, you can find more details here.